People in groups act aggressively as a group, not as a collection of individuals. 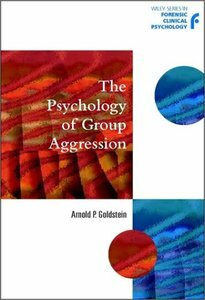 The Psychology of Group Aggression's comprehensive journey starts with group dynamics theory and research by reviewing its relationship to aggression. Arnold P. Goldstein then provides a unique and valuable insight into the different types and levels of intensity of anti-social behavior, examines its causes and considers its costs. In separate chapters he considers low intensity aggression, including ostracism, hazing, teasing; mid-intensity, e.g. bullying, harassment; and high intensity aggression e.g. mobs and gangs. In a final section, he considers management and intervention techniques, both those widely employed and emerging methods. An important work for both a pure and an applied audience, this will be a key reference for many, including clinical and forensic psychologists, psychiatrists, criminal justice workers, social psychologists and academics and students in criminology, psychology and sociology. Published in the Wiley Series in Forensic Clinical Psychology Series Editors: Professor Clive Hollin, University of Leicester, UK and Dr Mary McMurran, Cardiff University, UK.